Pablo Picasso with one of his paintings. Marcial de Fonzo Bo as Picasso in 'Midnight in Paris'. Gertrude Stein (Kathy Bates) and Marical e Fonzo Bo (Picasso) in 'Midnight in Paris'. In Midnight in Paris, Gertrude Stein, introduces the film's hero, Gil, to Picasso. The artist's current mistress is the fictional figure Adriana, but Picasso views her as disposable, and Adriana and Gil spend much of the movie having a soul to soul relationship. Although Adriana is a product of Allen's imagination, Picasso was indeed an unashamed womanizer whose treatment of his mistresses was not exactly distinguished by its constancy or kindness. 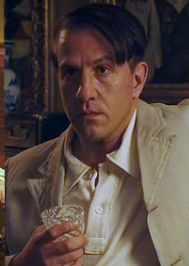 Picasso is not an important figure in Midnight in Paris, but Allen's inclusion of him in the gatherings of the cultural expatriates that are the focus of the movie is accurate. Picasso was a key influence in the Parisian cultural and intellectual world from the early 1900s to the 1930s. It was also appropriate for the film-maker to include Picasso in the movie because the artist was greatly influenced by early movies. He was a great fan of the early movies of his youth, fascinated by their changing perspectives and their ability to manipulate time, motion and space so effortlessly. The changing tones of light provided onscreen may have influenced Picasso's breakout painting, 1907's "The Demoiselles of Avignon". The director Martin Scorsese maintains that these movies were the overlooked catalyst of cubism: like movies, it represented "a radical change of vision itself". 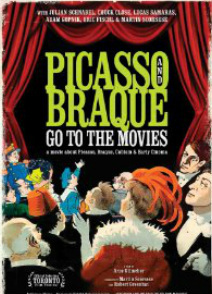 (For more details, see the documentary Picasso and Braque Go to the Movies, narrated by Scorsese). Like Picasso, Salvador Dali was born in Spain (very close to the French border).And like Picasso, he not only came from a relatively prosperous family; he too showed precocious artistic talent. 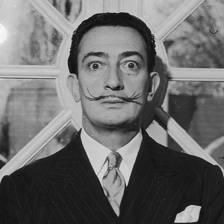 The younger Dali was determinedly eccentric in appearance and lifestyle, a characteristic that remained throughout his life. 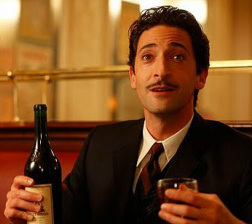 The actor Adrian Brody's portrayal of Dali in Midnight in Paris is relatively subdued, although he does a good job of capturing the artist's intensity. The film is accurate in showing that Dali moved in the same Parisian circle as Picasso and Luis Bunuel. Dali had become friendly with Bunuel when the pair were studying at the Madrid School of Fine Arts in the early 1920s (he was expelled for fomenting unrest). In 1926 he went to Paris, and became friends with Picasso and reunited with his fellow surrealist Bunuel. In 1929 he worked with Bunuel on the script for the latter's famous/infamous surrealist movie Un Chien Andalou. In 1945 producer David Selznick and director Alfred Hitchcock hired Dali to film a dream sequence in Hitchock's psychological thriller Spellbound. Originally about 20 minutes long, its length was considerably reduced in editing at Selznick's demand. Dali lived until 1989. His work and life attracted both scorn and admiration. For some he was an exhibitionist who squandered his talents in search of wealth and and notoriety. For others he was a true artist, scornful of the conventions of both bourgeoisie and intelligentsia. For more details of his fascinating life, visit The Dali Museum site. Dali with the photographer Man Ray, who also makes an appearance in the movie. 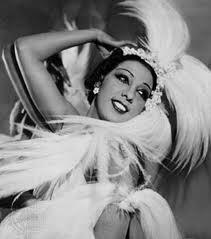 Born in 1906 in St.Louis, Baker was an African-American singer and dancer who gained fame in the Paris of the 1920s. She started out as a dancer in dance group; after moving to New York she attracted attention with her performances at the famous Harlem Cotton Club.In 1925 she went to Paris to perform in the La Revue Negre and the next year she moved to the Folies Bergere. Her style of dancing and her costumes -especially a skirt made of bananas - gained her fame and fortune. She was highly praised by, and very popular with, cultural expatriates such as Hemingway and the Fitzgeralds. Her brief appearance in Midnight in Paris accurately reflects this popularity and also her sinuous style of dancing. Her star power increased when she added singing to her dancing repertoire. Baker remained a popular figure on the French stage / nightclub scene for years. In turn she enjoyed the more liberal French attitude to race; she became a French citizen in 1937.